Welcome to “My Music,” where I share some of my compositions. I employ a range of compositional styles, sometimes purely, sometimes in combinations. 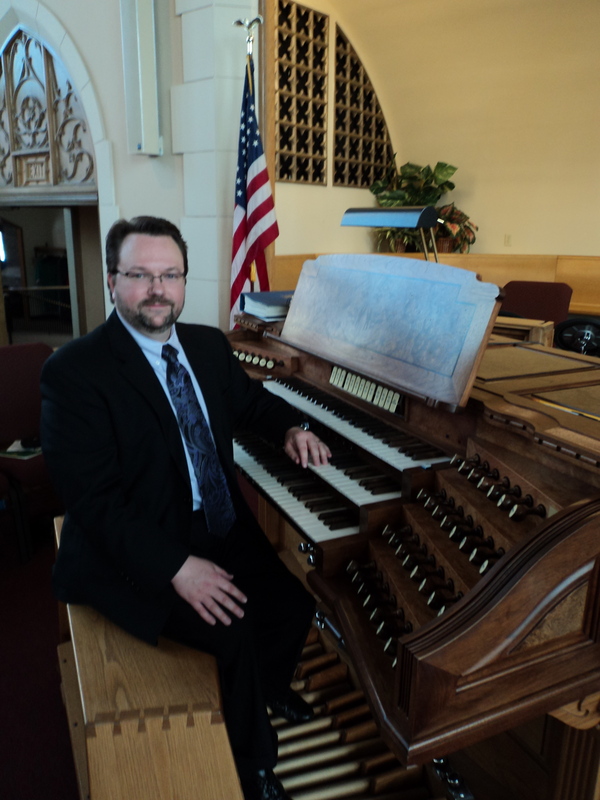 Most of my music is instrumental, and much of it is for piano and organ, although I have been steadily expanding my body of music for chamber winds and strings during the past two years. Several examples are available on this page, as well as in my post, My Chamber Recital from April 2016. You can also find additional pieces on my YouTube channel. This past summer, I revisited some of my older piano arrangements. Here is “Nobody Knows the Trouble I’ve Seen,” an arrangement I wrote in 2006, during our time in Michigan. I recorded it during the summer after playing it at church. Stan Pelkey, composer and pianist. “We Give Thee But Thine Own” is another of my older arrangements from our time in Michigan. Although I had not played this piece for several years, it remains one of my favorite hymn arrangements. Stan Pelkey, composer and pianist. The summer-time musical experimenting continues. I wrote this melody (heard in the flute in the recording below) in 1987 (!) for a song I was trying to write back when I was 15. I never finished the song, but when I looked at the melody again a few days ago, I thought it had some promise. Here it is with a completely different accompaniment (guitar and piano) and a very different approach to the overall mood. “Song for Flute, Guitar, and Piano,” Stan Pelkey, composer. During this past summer, I began composing electronic music inspired by mid-twentieth-century electronic compositions, something I had been wanting to do for a number of years. You can hear one of my resulting essays in the underscore for an audio recording of part of one of my fiction works here. Two more examples are below. 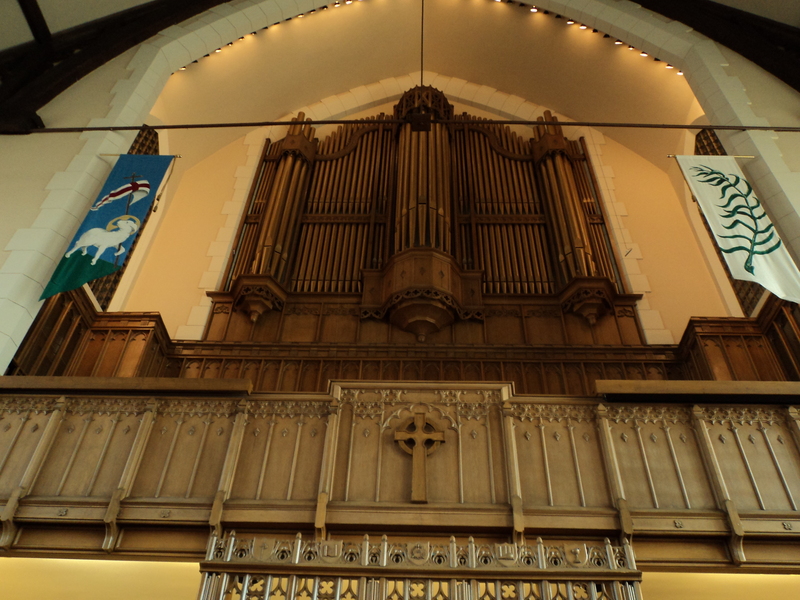 If you prefer acoustic music, scroll further down for some of my piano, organ, and chamber music. This piece was inspired by my teaching of world music to high schoolers during June and July 2016 as part of the FSU Summer Music Camps at the College of Music. It is another essay in electronic music (see more below under “Bird Song Study No. 3”). I created all of the original sound materials today, then modified them, and then shaped them into the final form. There’s a certain fireworks-kind of quality to the piece, appropriate for the day. (This sounds best with headphones because of some of the very lowest notes I have used.) Stan Pelkey, composer. This selection is among my first four experiments in electronic music using pre-existing, recorded materials. Everything you hear in this piece originated in actual bird songs, which I then altered to create unique musical building blocks. Underlying the composition is a set of three musical building blocks (one of which is quite long); together, they are repeated seven times, with variations over the top constructed from contrasting, shorter sound gestures. My “Bird Songs Studies” are collectively composed in honor of Tristram Cary, whose Steam Music (1978) has become one of my favorite pieces of twentieth-century music. Stan Pelkey, composer. “Fugue” from my Suite for Winds (2009); recorded live at the First Presbyterian Church, Thomasville, Georgia, April 17, 2016. Stan Pelkey, composer. 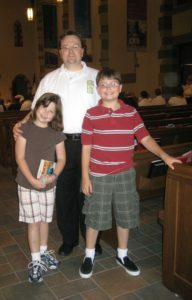 Variations on “Child of Blessing” (2005); recorded live at the First United Methodist Church, Kalamazoo, Michigan, March 2006. Stan Pelkey, composer and organist. 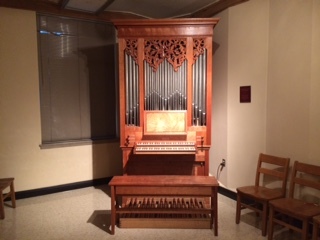 In the sanctuary at First United Methodist Church, Kalamazoo, Michigan (2008), where this piece was recorded. 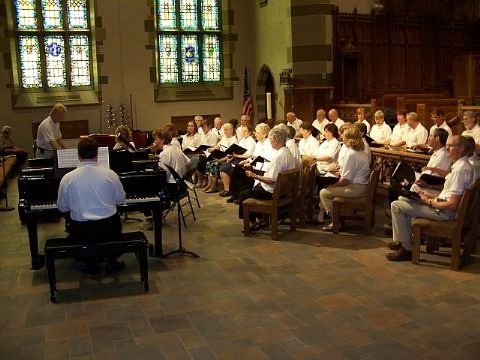 I composed the “Meditation on ‘Spirit of God'” for the 175th Anniversary of First UMC Kalamazoo (photo below). “Rondo on Two Sacred Songs” (2006); recorded live at the First Presbyterian Church, Battle Creek, Michigan, April 23, 2006. Stan Pelkey, composer and organist. The Dobson pipe organ at First Presbyterian Church, Battle Creek, Michigan, on which this piece was recorded. You can also visit my YouTube channel, which I launched in summer 2016.